What is the Village Drill? Village Drill > Blog > What is the Village Drill? The Village Drill is an affordable, transportable and durable manual borehole drilling machine. But, it all started as a dream. 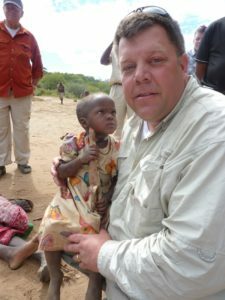 John Renouard, while visiting Tanzania with his family, saw firsthand the hardships that come from not having access to clean water. After his visit, he had a dream about a drill that could bring water to the impoverished men, women, and children he visited. The drill he saw in his dream was simple, cheap, and effective. Renouard was not an engineer however. To bring his dream to life, Renouard approached the engineering school at Brigham Young University with the hope that they could help bring his dream to life. After many hours and several prototypes, the Village Drill was born. 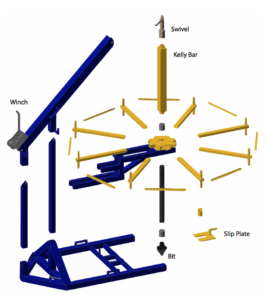 The Village Drill was built on the foundational principles of simplicity, transportability, and durability. Village Drills are delivered all over the world in a crate that weighs 1100 kg (2425 lbs), and can be transported easily in the back of a truck, boat, or wagon, allowing it to reach places other traditional drills aren’t able. Setup takes approximately two hours, and upon completion, the Village Drill weighs roughly 2,000 pounds. Only four people are needed to operate the drill. All the operators are required to do is spin a yellow wheel which powers the drill. Because the wheel works on a “flywheel effect,” it requires minimal energy to keep its momentum going. The Village Drill can run continuously, and in just eight hours reach depths up to 150 feet. While the drill is able to reach depths of up to 270′ (90 meters), often times water tables sufficient for year round supply can be reached well within these levels. Not only is the Village Drill efficient, it is also cost effective. At a price of only $18,000, the Village Drill is significantly less expensive than other drills. Villages, non-profits, and NGO’s who purchase the Village Drill are trained on how to properly use it, so that they can continue drilling boreholes even after The Village Drill representative leaves. The Village Drill may have started as a dream, but it is now a reality that is changing lives all over the world. We here at The Village Drill are working hard to ensure that John Renouard’s vision of making clean water accessible to everyone is accomplished one borehole at a time.